Emerald Creek Dares: Here comes SUMMER! Here in Alberta, Canada we have been blown away by a beautiful early spring. We felt excited and inspired to go to all of our summer inspired stamps, powders and charms. Look closely and you will see some of our NOT SO summery stamps have also made an appearance with a twist and I love it. 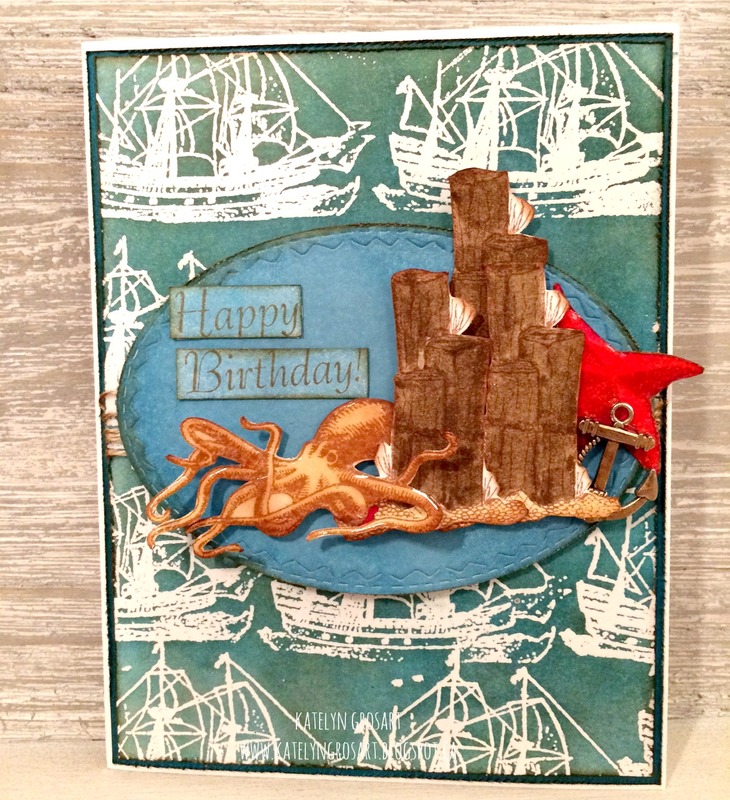 It's all about the beach and water for this challenge, so I decided that I would create a ocean themed birthday card. 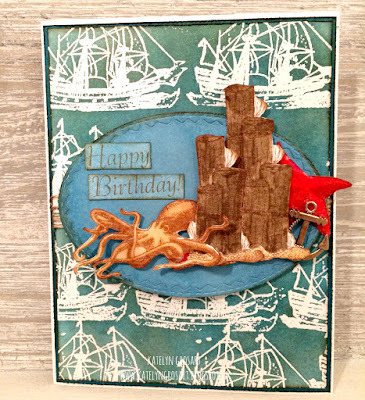 Head on over to my blog to read all about how I created my card and my custom background. The sun finally starts to heat and hopefully the New and Old Danube will be warm enough soon to go swimming (or at least kayaking)! But in the meantime let's dream of sandy beaches, colourful beach huts and waves crashing on the shore. Well ... It is all about the water, beach, summer!!!! 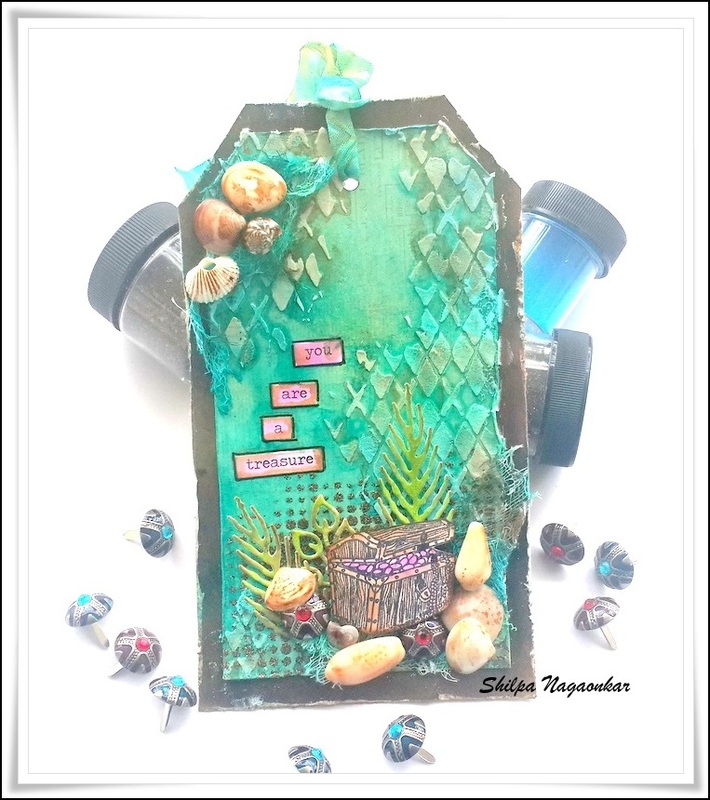 decided to use a Christmas stamp to create a coral background for my sea. 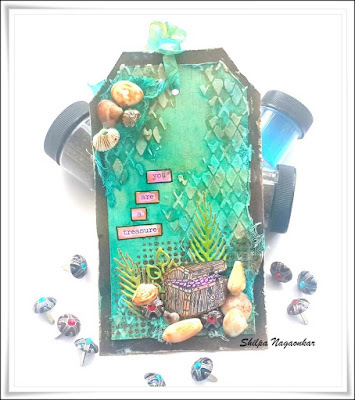 Come by the blog to check out how to make your coral reef!!! 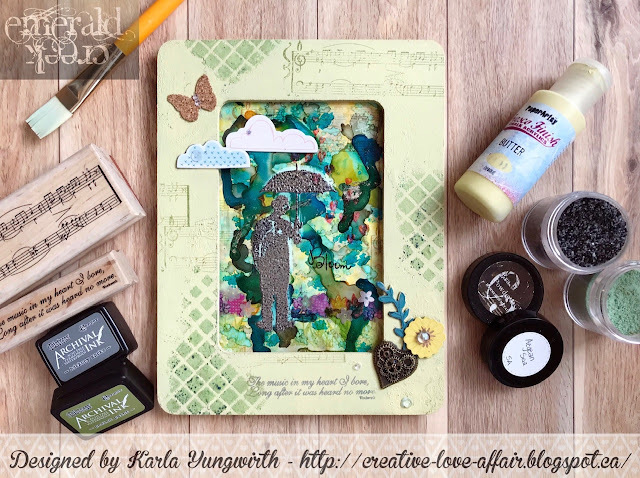 I love the summer, the beach and spending time with my kids as you can see from my newest frame! It's size is 11" X 22" and the three pics I used are top to bottom from 1998, 2004 and 2014. Head on over to my blog to see all the details on this one! I wanted to use this lovely "See Chest" image from Emerald Creek for this summer theme challenge. I created tag with sea shore in the background. Pamellia please email Kim at admin@emeraldcreek.ca for your prize code. On a personal note, I don't normally lend my platform to too many societies. Today I feel compelled to use my connections to help aid in the for help from Albertans who have lost their homes. There is the $5.00 campaign going on to try and raise funds for so many people. I have heard fires are breaking out in BC now too. If you have the ability to help the aid workers and families who are falling victim. Please click the photo to head the the Red Cross Website to donate. through Facebook and other medias there is also the ability to help with food, clothes, supplies and craft supplies. Biggest congrats to some of my favorite bloggers! Great projects girls, such an inspiration. Also wow, what a summer breeze! Great DT inspiration!!! Congratulations Pamplin on your win & to our top 3, Lisa, Sara and Jenny! Incredible creativity you girls share with us! And to the beachy DT projects...inspiring as always!! Congrats to all the winners and wow what amazing inspiration from the Design Team - gorgeous! Have a great weekend. Congrats to Pamellia for winning this challenge as well a congrats to the other top 3! Great work this challenge design team! Wow! You ladies know how to celebrate summer in style! Beautiful inspriation from the Design Team! And shame on me for not dropping in sooner. Long story, but I'm trying soooo hard to catch up! Yippee for Pamellia on being the winner with her beautiful card, to Lisa with another, and Jenny with her fabulous canvas! I am truly honored to have my card listed among them as one of your Top 3!! !